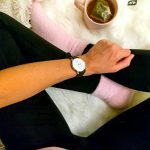 After exploring various skincare brands throughout the year, testing them, finding what works, what doesn’t work, what feels best and familiarizing myself with the specialty products we have available, I’ve learned so much about the beauty in natural ingredients and how amazing they really are. So I sorted through my favorites and what products I go back to most, and my Natural Vegan Skincare Routine came to be. This is a much requested post so, can’t wait to hear if you use the same products or what you include in your routine! 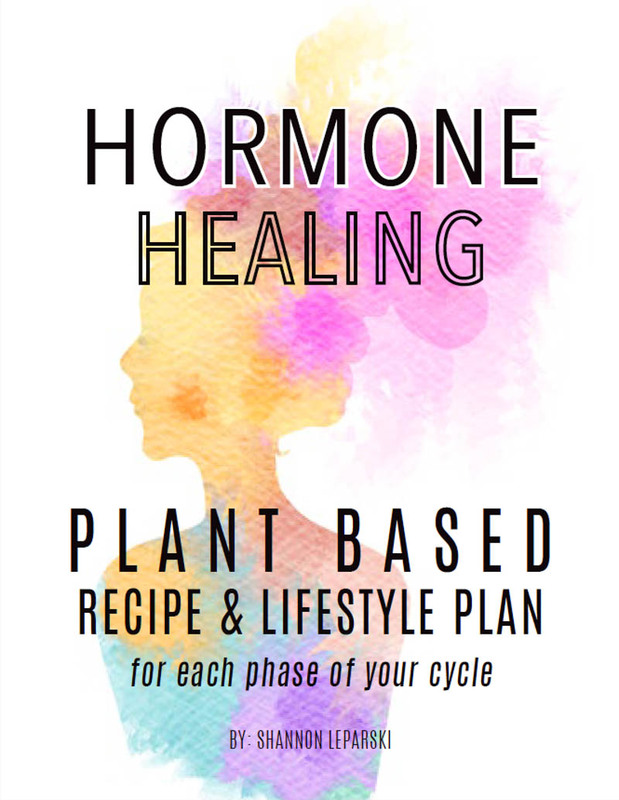 overall lifestyle, eating habits, exercise, environment, stress, hormones, hydration, medication, makeup and more. 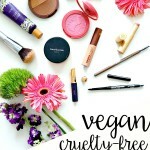 cruelty free – vegan – natural – organic – simple and affordable. Reading/quickly scanning the label and ingredient list have become habit for me. Checking helps me learn and know if it’s good or full of harmful ingredients. The vegan, organic and cruelty free bunny symbols are helpful indicators to look for. Are you a product fiend like me?! I’ve learned my lesson to be careful and not to over-do it which always aggravates and causes redness. We don’t need much to keep our complexion healthy and mine actually refers when I keep it super simple with minimal products, while sticking to a routine. That’s a recipe for success. 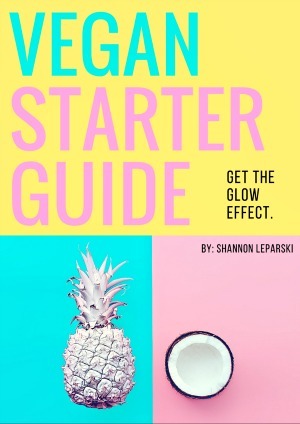 Following a veggie-filled life has taught me that our eating habits play a major role and directly correlate with glowing skin and overall complexion. It’s also influenced everything I buy at the store and in general, but especially with skincare because we absorb so much of whatever beauty item we put on. Living with compassion and practicing mindfulness make life that much sweeter and your skin will thank you for it!! In the morning and most nights, I’ll wash my face with the wondrous Enzymatic Therapy Derma Klear Soap – specifically made for acne and blemish-prone skin. It deeply cleans, quickly dries up blemishes (in like 1 day, I swear) prevents future blemishes and balances oiliness – I LOVE this soap. With 5% sulfur (compared to most other sulfur soaps with 3%) it’s made of all natural, fragrance-free ingredients. 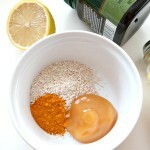 There’s a slight sulfur-like smell but it doesn’t bother me – anything goes if it helps maintain balanced, clear skin. It’s not drying either as I was concerned about that. I’ve heard about sulfur soaps working wonders for anyone with acne and I’m thrilled that it really does work. The sulfur soap is best in the morning to control oil throughout the day. Most nights I will use it, especially now during the summer months, but if I’m ever bored of it, I reach for the Alba Botanica Hawaiian Pineapple Enzyme Cleanser . It’s great for those of you who have more normal skin and just want something gentle that deeply cleans and brightens. The best part: it smells like a tropical paradise. First, I wet my face with warm water, apply the soap with my fingers and then use this Ecotools Konjac Sponge to gently massage it in for about 2 minutes, rinse with warm water and gently pat dry. If you’re on the lookout for a new cleanser specifically for acne prone skin – I highly recommend you try it. The konjac sponge is sweet and gentle for everyday use. Once the sponge gets wet, it gets really soft and squishy! It’s kinda hard not to play with it ha. 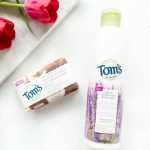 Exfoliating is imperative to brighten and slough away dead cells, but it should be super gentle – not harsh – because you don’t want to damage or tear that delicate skin. 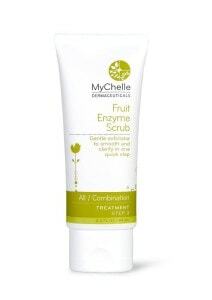 MyChelle makes amazing vegan products, with my all-time favorite being the MyChelle Fruit Enzyme Scrub . I’m all about those enzymes. The fruit scrub clarifies and polishes with jojoba beads and dissolving enzymes to remove built-up debris and dulling residue. Yes please. I use this 1-2 times per week. 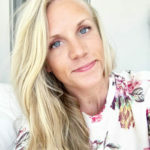 I absolutely love love love the Clarisonic Mia to deeply clean and exfoliate but once again, I have to be careful – it can be a little rough for my skin if I use it too often. If I’m having a good skin day, I don’t use it. Only if I was wearing more makeup than usual or if I feel like I need a good scrub, then I’ll use it – probably once a week (always at night) but more like once every other week. It feels soooo smooth afterward. Definitely worth the investment. 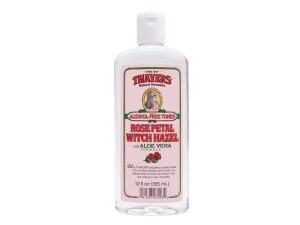 Last year I did a post on beauty products and mentioned this alcohol-free Thayer’s Rose Petal & Witch Hazel Toner which I’m still obsessed with and use after cleansing. The gentle formula calms skin, evens out tone, moisturizes and soothes with aloe vera. I’ve considered it a definite staple in my routine for a while now. Plus, it smells like fresh roses and makes me happy. When I notice a blemish coming on or feel like I could use a little anti-bacterial action, I switch to a homemade 2-ingredient toner made of raw apple cider vinegar and filtered water. 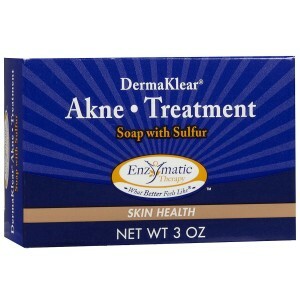 This helps to balance the skin’s pH and rid of any acne-causing bacteria. Mix 2 parts ACV + 1 part water for a simple toner. Use this only at night unless you want to smell like vinegar! After my face is all fresh and c l e a n, I hydrate with Juice Beauty’s Organic Oil-Free Moisturizer . It’s lightweight, absorbs super quick which I can appreciate (no greasy after-feel), smells yummy and feels so soothing. Made with certified organic grape, pomegranate, soothing aloe vera, vitamins, antioxidants, & nutrient-rich sea algae (here we go with the algae again. I love E3Live ♥) it’s sure to quench your skin control oil. Finding a moisturizer that doesn’t dry out your skin but at the same time doesn’t leave it sticky/greasy is challenging to find, but I’m so happy with this moisturizer because my skin feels soft, smooth but never sticky. It’s designed for all skin types as it naturally balances your skin’s moisture levels but I find it works especially well for my oily-prone skin. The Juice Beauty products are amazinggggg. It’s no secret that I crave a natural, sun-kissed glow. I can’t help it. So I opt for a best-seller from Tarte. Everything from the Tarte line feels so luxurious to me, there’s just somethin’ about it. This formula for face and body (don’t worry, it won’t cause breakouts) is called Tarte Brazilliance Skin Rejuvenating Maracuja Self Tanner . Totally natural-looking, deep-bronzy color, not a hint of orange, smells good, works almost immediately, vegan.. need I say more? Following my moisturizer at night and about 2-3 times per week, I squeeze out a teeny amount, rub it on my fingers and dab on all areas of the face where the sun would hit – like the makeup artists say to do with bronzer. So the forehead and cheekbone area mostly. Blend it well by dabbing it in. If I put this tanner all over my face, it just wouldn’t look right.. at least not for me. It will appear dark which is why applying it at night and then washing your face in the morning will give you a perfect summer glow! That’s it! 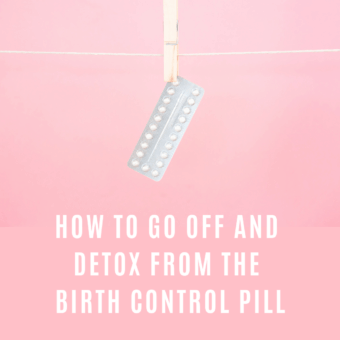 Do you use any of these already? What are your must-have and go-to skin products? I have extremely acne prone, sensitive skin and and I can only use natural/organic products. The Made from Earth Control Acne Wash is amazing! After using it for just 3 days my skin looks beautiful! Make sure to moisturize after too! Skin care products can be a major source of toxins for many people. 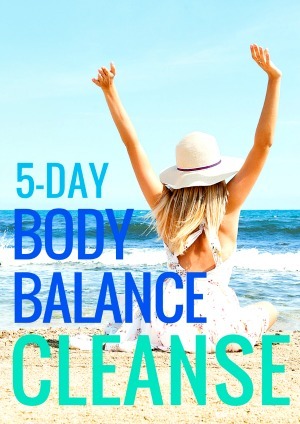 Most are packed with chemicals and artificial ingredients that might have a temporary positive effect on the skin, but will have negative long term effects.These artificial ingredients can also be absorbed into the skin and build up in the body.The good news is that there are natural, simple and inexpensive options that actually work better than most commercial products. 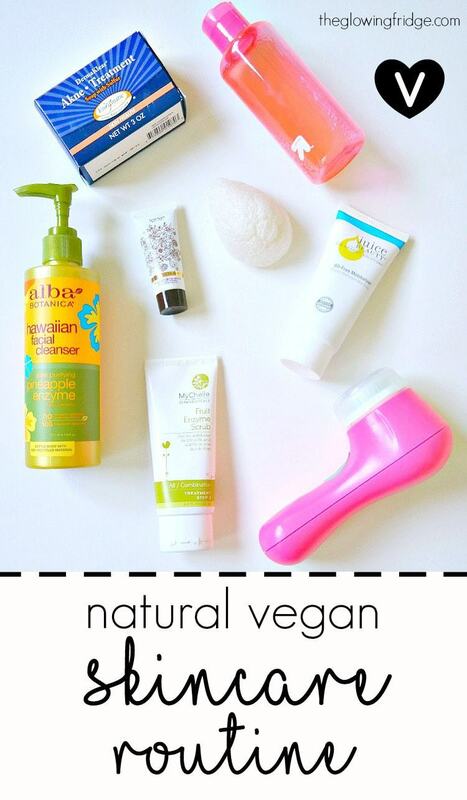 I will definitely try these natural vegan skin care products you shared. I haven’t use any of these yet, but since these products are natural I’ll try all of them. Thank you for sharing. 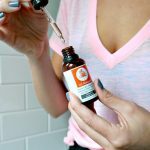 Good article; another excellent topical treatment is sea buckthorn oil. It was proven in one study to reduce oily skin by 45% after 8 weeks. It contains two compounds (stigmasterol and beta-sitosterol) which bind to your oil glands and reduce their activity. It’s probably one of the best natural skincare oils out there, particularly for acne, but it rarely gets discussed. Make sure you buy the sea buckthorn berry oil however, as opposed to the seed oil. I need to thank you for mentionning DermaKlear. After moving abroad in a very different climate, my skin has been acting up and I resorted to very harsh chemicals. However, after reading this post, I ordered the soapbar and, oh.my.god. Please know that you have made the world’s difference in my small wold. Hi! Do you do each of these steps everyday ? Like do you use the toner and the moisturizer both in one day! What about an SPF moisturizer? I have been vegan for about two months now, and one of my favorite things about it is that I tend to buy natural products. The next step for me will be to switch my skin care products over, too! I’ll have to check out the bronzer that you mention, because I too love a good tan, but don’t love the skin damage! Ever since I quit using the store-bought products and went all-natural, my face has reduced in redness dramatically. Coincidence? I think not. I will have to check this routine out. Thanks! Thank you for sharing this wonderful routine of yours Shannon. It is actually helpful to me and will try some products that you included. Thanks for sharing this awsome tips with us! Hey Danielle – thanks for stopping by 🙂 I’m happy to share what’s working for me! Hi, i love creams Monsia. I was so excited to see this post! I have very oily skin and I struggle constantly with blemishes and blackheads. I use Thayer’s witch hazel and love it, but I’d never heard of sulfur soap. I’m up for any natural, gentle way to help control oil. I’ll have to try it! Thanks for sharing! Oh my! So many steps! I take for granted that I am blessed with great skin. A simple soap up in the shower once a day and a pat of moisturizer is it for me. I like Purple Prairie’s Carrot Rose face cream. 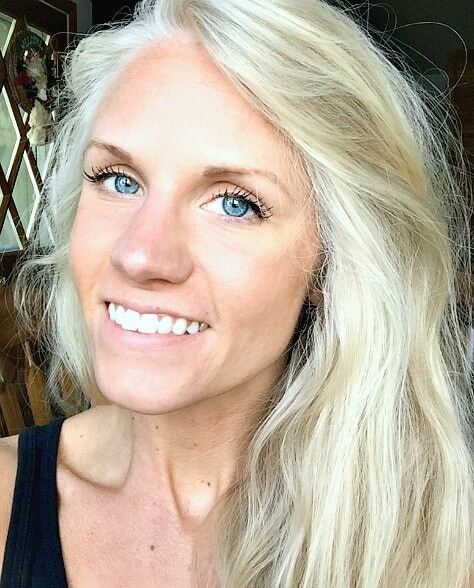 I should try a little exfoliating and toning – the results might be awesome! Thank you. I may have to try that soap, too. You do look radiant!